PNNL: Scientists Refrigerate Water...with Lasers! 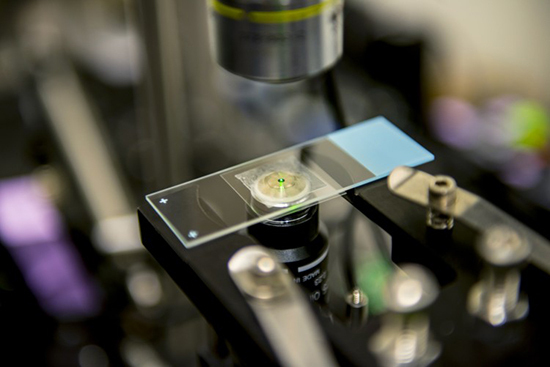 A research team at the University of Washington has demonstrated - for the first time -- that lasers can cool liquids in real-world conditions. In the study, the team developed an instrument using infrared laser light to to cool water by about 36 degrees Fahrenheit -- a major breakthrough in the field. The team lead, Dr. Peter Pauzauskie, is an assistant professor at the University of Washington who holds a dual appointment at the Department of Energy's Pacific Northwest National Laboratory. Why It Matters: The discovery could one day help industrial users "point cool" specific components and help with biological applications such as studying cells. "Using laser cooling, it may be possible to prepare slow-motion movies of life in action," said Pauzauskie. "And the advantage is that you don't have to cool the entire cell, which could kill it or change its behavior." More information about this work is available in this UW news release. Sponsors: This research was made possible by a grant from the Air Force Office of Scientific Research Young Investigator Program, start-up funding from the University of Washington, as well as a capital equipment donation from the Lawrence Livermore National Laboratory. P.B.R. thanks the National Science Foundation for a Graduate Research Fellowship. M.J.C. was supported by the Department of Defense through the National Defense Science and Engineering Graduate Fellowship Program. P.J.P. gratefully acknowledges support from both the US Department of Energy's Pacific Northwest National Laboratory (PNNL) and the Materials Synthesis and Simulation Across Scales (MS3) Initiative, a Laboratory Directed Research and Development (LDRD) program at the PNNL. Reference: Roder PB, BE Smith, X Zhou, MJ Crane, and PJ Pauzauskie. 2015. "Laser Refrigeration of Hydrothermal Nanocrystals in Physiological Media." Proceedings of the National Academy of Sciences USA. Early Edition Online.